Free-to-play turn-based RPG World of Warriors has been out on mobile platforms since November 2014. The game proved successful enough to warrant a port exclusively to the PlayStation 4. Almost three and a half years later, has enough revamping and retooling of the original game’s systems been done to guarantee a fun time on a home console? Or was this always a port doomed from the start? Time to find out in our World of Warriors PS4 review. 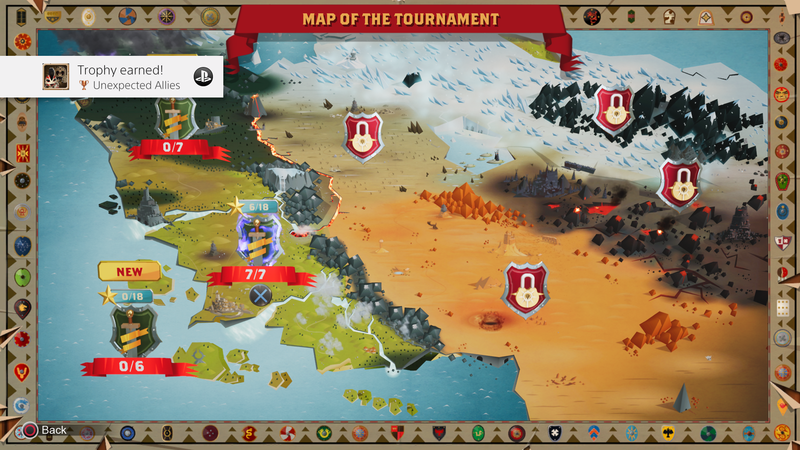 The original mobile version of World of Warriors featured a simple battle system consisting of various swipes and timed taps. All of that is eschewed in favor of using the DualShock 4. 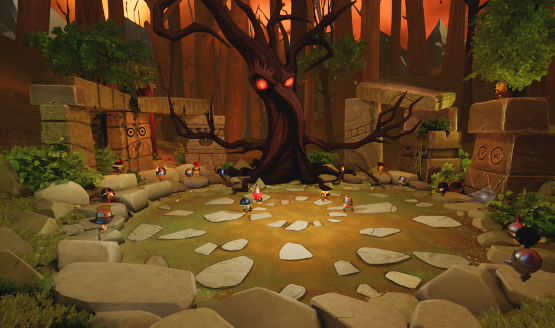 Rather than battles taking place as turn-based affairs, the battle arenas have been opened up into proper arenas, and players are free to roam about and attack at will in real-time fights. The ensuing transition from mobile platforms to console has thus transformed World of Warriors into something more akin to a beat-em-up or hack-n-slash. Attacks are relegated to the face buttons, with the Cross button performing dodges and Triangle doing double-duty as a chargeable heavy attack as well as picking up certain items such as bombs. The controls are simple to get acclimated to, to the point that there’s not a whole lot of depth to be found. World of Warriors features a colorful palette, with venues that range from dark and moody forests, to bright, wet docks, and other locations. Each arena contains hazards as well, such as whirlpools in a river, or other hazards triggered by the player. The general design aesthetic is pleasing to the eye, and onscreen graphics and effects are simple enough that the PlayStation 4 has no problem keeping the frame rate steady. Although the mobile version of World of Warriors boasts nearly 140 characters to collect and battle, the console port somehow only ships with 40. That’s a massive difference, which could only be explained away if the development cycle for this port was extremely short. Again, considering the mobile version is free, the expectation should be to include all characters as unlockable, which would otherwise have to be paid for. The characters that have made it to the PS4 version of World of Warriors stay true to the theme of historical figures. Each fighter is based on a certain type of warrior from throughout history, from Roman gladiators to Japanese samurais. They’re all presented in a cartoonish style, with large heads and small stature. The limited selection means that some fans’ favorite characters are likely to be excluded, unfortunately. Some aspects of freemium games have been shed for this console release. World of Warriors’ in-game currencies are still here, but are given out in copious amounts for battles won. Playing through just a handful of levels will usually result in enough gems collected to unlock a new character, while crafting ingredients are also given out during battle from hitting treasure chests. Characters will now also automatically level up once enough experience points have been gained; previously, characters would have to be sent away to train in order to level up, and rendered unavailable to fight until the process was complete (naturally, using/purchasing premium currency could speed up the process for those unwilling to wait). There are also no energy systems to speak of, so the game can be played for as long as is desired, without waiting on some random meter to recharge over time. Some of these aspects have clearly been changed for the better. World of Warriors attempts to cast off its past as a mobile title, and in that regard it mostly succeeds. The new control options available thanks to the simple inclusion of a proper input device means that combat is tighter, and combos are easier to pull off. At about $20, though, most people might be inclined to keep playing the mobile version without a killer reason to pay money for something that’s free elsewhere. For some, local co-op may be worth the price of admission, but for those without others to play with, the asking price may be a bit too steep at launch. World of Warriors review code provided by publisher. Version 1.01 reviewed on a PS4 Pro. For more information on scoring please see our Review Policy here.